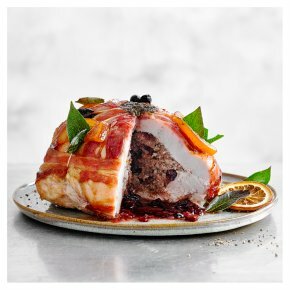 Savour tender boneless turkey breast stuffed with fruity pork sausagemeat and draped in bacon, with a surprise, oozy cranberry centre. The ultimate combination of sweet, savoury and smoky that will add plenty of festive cheer to your dinner table this Christmas. Guests will love seeing the hidden centre unveiled as you cut into this mouthwatering parcel. INGREDIENTS: turkey breast meat (64%), pork shoulder (19%), sprucewood smoked dry cured streaky bacon (5%) (pork belly, salt, preservatives (potassium nitrate, sodium nitrite), antioxidant (sodium ascorbate)), cranberries (3%), cane sugar, demerara sugar, rice flour, unsalted butter (milk), orange, morello cherries, fructose syrup, water, gram flour, orange zest, maize flour, apple concentrate, sucrose, wheat glucose-fructose syrup, red wine vinegar, concentrated cranberry juice, salt, red wine, pork gelatine, amaranth flour, rosemary, ground cinnamon, cornflour, colour (anthocyanins), preservatives (sodium phosphates, sodium metabisulphite), bay leaf, maize starch, sage, black pepper, ground ginger, sunflower oil, teff flour, ground allspice, ground nutmeg, concentrated vegetables, dried glucose, maize dextrose, ground cardamom, sea salt, flavouring, ground star anise, ground mace, white pepper, acidity regulator (citric acid), tangerine oil, ground clove.